You're about to see a different side of me, because I LOVE babies. I'm probably going to embarrass myself a whole lot by singing and talking to your baby, but we usually develop a pretty special bond. 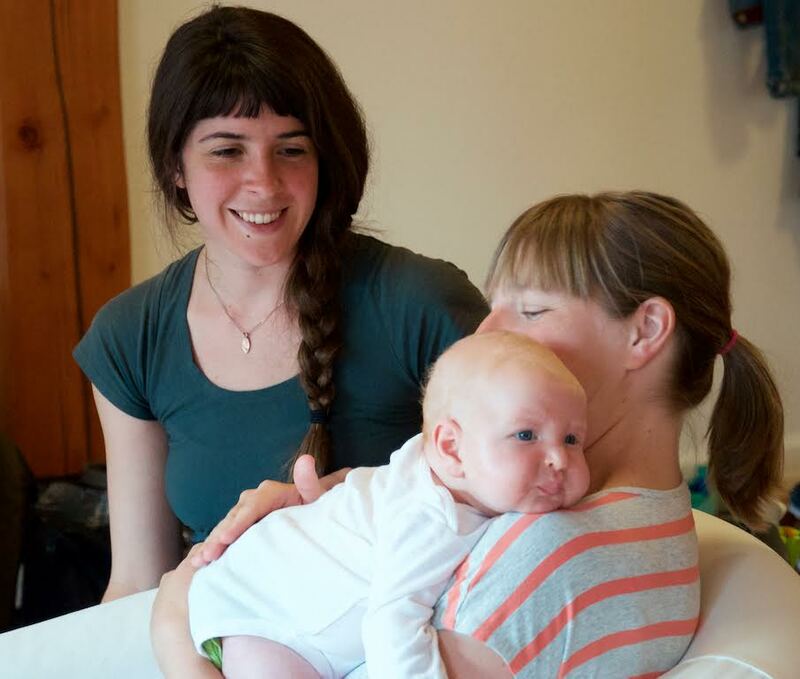 I like to combine Craniosacral Therapy and a little bit of Maya Abdominal Therapy during our visits, depending on what your baby's body needs. Every baby deserves work to resolve and prevent issues for a happy home life. I usually recommended 2-4 visits pretty close together. If you have a hard time seeing this on the scheduling site, let me know ASAP and I'll find a way to fit them in. When working with your baby, I take into consideration how their body was placed while in your belly, and their birth story. Were they breech? Low? High? Folded funny? In a bicornuate uterus? Under a lot of stress? Being born is a lot of work. Was it a fast birth? Really long? Vaginal? Epidural, forceps, vacuum? C-section? Meconium? It's a good story, and I want to know how they came into the world. For instance, when I was born to my Mom, I was delivered via C-section after a long labor, and I was pretty far wedged in her pelvis. When I gave birth to my son, it was a healthy, normal delivery, but he shot out so fast he fell on his head onto the floor. It was only a few inches on to a carpet, and he was fine, but both of those stories are important to me and our bodies afterwards. Using a super gentle, but effective approach, I aim to help babies with breastfeeding issues, acid reflux, constipation, crooked smiles, cranial bones that override, plagiocephaly (flat head), babies who only turn their head to one side, babies who only raise one arm, torticollis, hip dysplasia, fussiness, failure to thrive, and more. If your baby has a lip or tongue tie, they need work before and after a revision. It is important to still get the restricted fascia moving to make the revision treatment more effective. Special note to Mom: I have a comfy chair, hot coffee/tea/hot chocolate, and toys for your older kids. Special note about Baby: Your baby might cry while you're in my office. They're a baby. I'm not squeamish about them acting unhappy, or fussy, or loud. I don't expect them to be on their best behavior for me. Don't avoid coming in because you're embarrassed. I'm a Mom, too, and I'm happy to help. Special note about Dads: I'm married to a pretty meat and potatoes guy who has never thought about getting bodywork. He thinks what I do is weird, and he’s not really sure if/ how it works. Your partner might be similar. They may be weary about spending extra money, or you might kind of cut around telling them honestly what you're doing. I get it, but I'm not here to impress dudes. I'm here to help mom and baby nurse comfortably, feel better in their body, turn their head to both sides, and poop every day.